definitely a conversation starter! why? because of the brilliant flashes coming off these 6 sparkling hand-faceted ruby oval petals surrounding the ruby center...deep fuchsia pink and a pretty flower design which measures 1 3/8in"! these stones are genuine gemstones securely bezel set in bright & shiny .925 sterling silver...it has maximum sparkle, you'll see....it's TRULY UNIQUE! i promise!! ~ i am such a lover of all floral inspired designs....i love the vintage appeal of this gemstone blossom -- 6 dk pink kunzite petals that swirl around 6 peridot & dk garnet center stones....vibrant color & substantial size is found in this pretty floral design about 1in in width! all of the gemstones are beautifully hand-faceted with clever cut-outs behind each stone that allow light into each stone and create the maximum sparkle, also all are professionally bezel set in shiny .925 sterling silver....quality stones and craftmanship. so pretty and TRULY UNIQUE! you'll love it, i promise!! 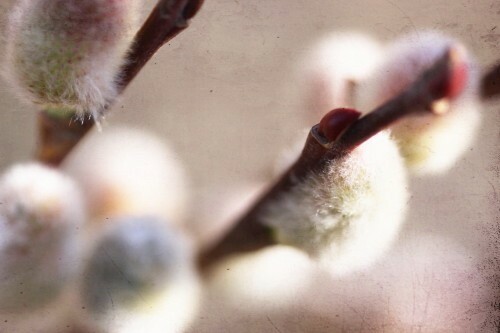 February Garnets...come in many shades! 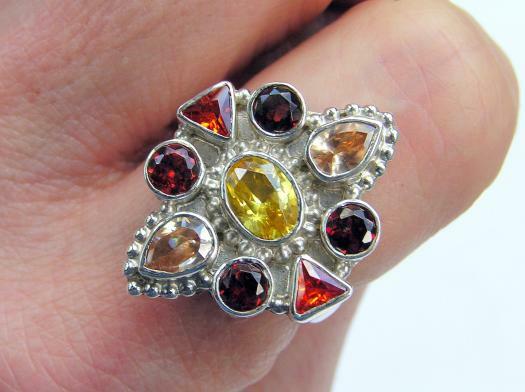 ~ a little Aztec influence is found in these sparkling garnets that circle the center citrine oval stone - yes, garnets come in many beautiful warm shades -- vibrant colors & substantial size is found in this lovely design about 1 1/8in x 3/4in! all of the gemstones are beautifully hand-faceted with clever cut-outs behind each stone that allow light into each stone and create the maximum sparkle, also all are professionally bezel set in shiny .925 sterling silver....quality stones and craftmanship. so pretty and TRULY UNIQUE! you'll love it, i promise!! ~ a sterling tidepool is surrounded by gorgeous sparkling swiss blue topaz stones .... a mix of 6 sparkling stones that swirl in a vibrant aqua color and are of substantial size about 5/8in x 1in! all of the gemstones are beautifully hand-faceted with clever cut-outs behind each stone that allow light into each stone and create the maximum sparkle, also all are professionally bezel set in shiny .925 sterling silver....quality stones and craftmanship. so pretty and TRULY UNIQUE! you'll love it, i promise!! ~ definitely a conversation starter! why? because of the ladder of gemstones & the glowing stick pearl....sparkling hand-faceted ruby, rose quartz, citrine, green amethyst along with a lg peacock freshwater stick pearl stacked in a lovely ladder design which measures 1 3/4in"! these stones are genuine gemstones securely bezel set in bright & shiny .925 sterling silver...it has maximum sparkle, you'll see....it's TRULY UNIQUE! i promise!! ~ the elusive green amethyst....so mysterious! four beautiful & brilliant hand-faceted amethyst stones full of sparkle...light celadon green reflects in this elongated feminine design which measures 1 5/8in in length! these stones are genuine gemstones securely bezel set in bright & shiny .925 sterling silver...it has maximum sparkle, you'll see....it's TRULY UNIQUE! i promise!! ~ i am such a lover of all floral inspired designs....i love the burst of a dk blossom design of rich garnet petals that swirl around the mother of pearl center....vibrant color & substantial size is found in this pretty floral design about 1 1/2in in width! all of the gemstones are beautifully hand-faceted with clever cut-outs behind each stone that allow light into each stone and create the maximum sparkle, also all are professionally bezel set in shiny .925 sterling silver....quality stones and craftmanship. so pretty and TRULY UNIQUE! you'll love it, i promise!! ~ how about a some classic and traditional southwest flavor? this BIG & BOLD natural dragonskin turquoise ring is sure to go with any turquoise & coral pieces in your collection....the JUMBO oval cabochon alone measures about 7/8in long, then add the beaded border of the sm red coral & turquoise round cabochons and makes it -- 1 3/8in x 1 1/8in!! this genuine ring has all the elements of southwest shades - sky blue, spicy red, and cactus green....it's beautifully polished, oxidized, and securely bezel set in stamped .925 sterling silver. when it comes to classic designs & influences you can never go wrong! ~ the elusive aqua amatite gem...so mysterious! this is a HUGE center piece stone and full of sparkle ... natural light aqua reflects in this round solitaire design which measures 5/8in across -- with the scroll & braided border is 1 1/8in across! this stone is a genuine gemstone securely bezel set in bright & shiny .925 sterling silver...it has maximum sparkle, you'll see....it's TRULY UNIQUE! i promise!! 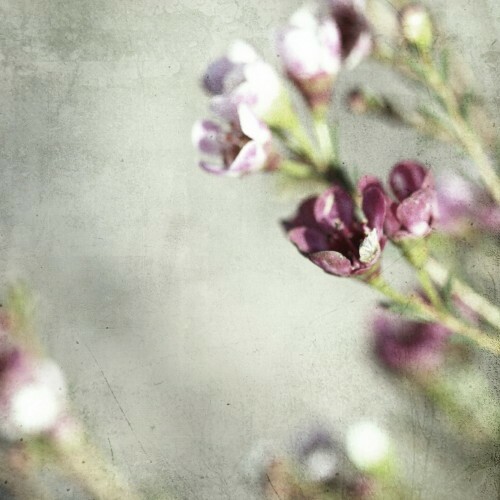 ~ i find flowers wherever I can -- even in the smallest of places! these remind me of the 70's Flower Power era, Russian enameling creates three little daisy blooms located along each side of the ring which lead to the 12 bezel set hand-faceted white topaz accents encircling a lg faceted blue topaz center which measures 9mm across.....ALL this action takes place on your little finger!! it's very unique and uncommon....little help is needed to be noticed when it comes to this fine .925 sterling ring! ~ i am such a lover of all floral inspired designs....i love the sunburst blossom design of these 10 rich garnet petals that swirl around the lg highly polished carnelian oval stone....vibrant color & substantial size is found in this pretty floral design about 1 1/8in in width! 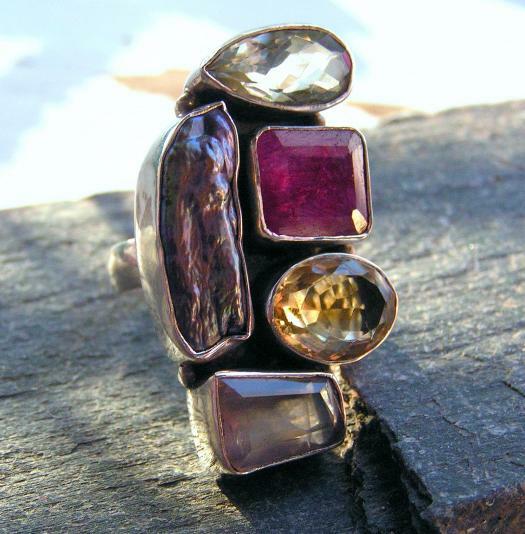 eacha of the garnets are beautifully hand-faceted with clever cut-outs behind each stone that allow light into each stone and create the maximum sparkle, also all are professionally bezel set in shiny .925 sterling silver....quality stones and craftmanship. so pretty and TRULY UNIQUE! you'll love it, i promise!! ~ definitely a conversation starter! why? because of the ladder of gemstones & the glowing stick pearl....sparkling hand-faceted genuine ruby, rainbow labradorite, golden citrine, smoky quartz along with a lg creamy freshwater stick pearl stacked in a lovely ladder design which measures 1 3/4in"! these stones are genuine gemstones securely bezel set in bright & shiny .925 sterling silver...it has maximum sparkle, you'll see....it's TRULY UNIQUE! i promise!! ~ how about a some classic and traditional southwest flavor? this BIG & BOLD natural dragonskin turquoise ring is sure to go with any turquoise & coral pieces in your collection....the JUMBO oval cabochon alone measures about 7/8in long, then add the beaded border of the sm red coral & turquoise round cabochons and makes it -- 1 1/4in x 1in!! this genuine ring has all the elements of southwest shades - sky blue, spicy red, and cactus green....it's beautifully polished, oxidized, and securely bezel set in stamped .925 sterling silver. when it comes to classic designs & influences you can never go wrong! ~ three little amethyst comets come blazing across this vivid orange sky....and it ALL takes place on your little finger!! 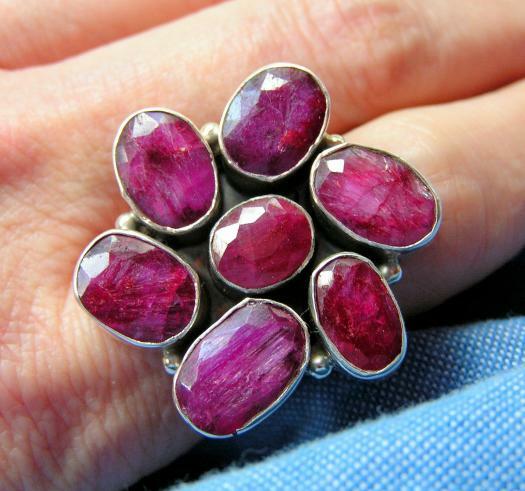 highly polished little amethyst cabochons set in sterling blazes among Russian enameling in the most vivid orange....it needs little help to be noticed when it comes to this fine .925 sterling ring! ~ a lovely collection of hand-faceted gemstones, such as: ilolite, garnet, citrine, peridot, amethyst, and moonstone -- each stone is gem-quality and fully hand-faceted loaded with sparkle the ring measures 5/8in x 1 1/8in....each stone is securely bezel set in smooth & shiny .925 stamped sterling silver, a truly beautiful design!